This week’s bike belongs to a patron who came into Bikeworks North looking for a suspension fork for his motorized Kuwahara. Normally, I’m not much of a fan of gasoline powered bicycles, but this one is such a tidy conversion that I had to take a picture. Also, the bicycle is a rather nice early 80’s Kuwahara. This winter I tuned up a very similar for sale at the shop, and if it had been a little bigger I’d have bought it for myself. In the past, I’ve had a sort of knee-jerk, negative reaction to motorized bicycles of all sorts. This attitude was exacerbated by often having to patiently explain to family members and acquaintances that I really DO like riding my bicycle to work and that getting a motorized one would definitely reduce the amount of exercise I was getting. Gasoline powered bikes, in particular are also loud, exhaust producing, and require trips to the gas station. I recent years, however, I have come to appreciate the utility of the new generation of electric bikes. While I don’t have any plans to get one for myself any time soon, I can see how they are useful for many people. In particular, they let a person make commuting trips of longer distances than they would normally be capable of. My instructor in a solar energy course used his in this way: riding his e-bike he was able to greatly cut down on the number of days he commuted using his truck. He also measured the energy required to charge the battery and determined that he was only paying 12 cents a day to use the bike. That’s a heck of a savings over the price of gasoline for a truck. Another natural application is in cargo bikes. 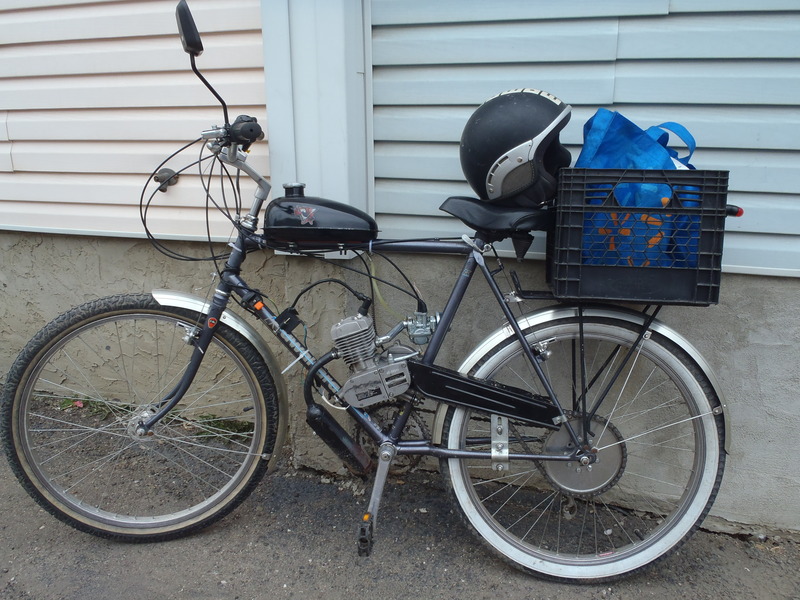 Adding an electric motor gives a cyclist the option of hauling heavier loads for longer distances. There are a number of electric cargo bikes on the market. At a local bike shop I was recently looking at a Trek Transport Plus, a slick looking machine. The nearly $3000 price tag puts it somewhat out of my reach at this time but I could imagine myself cobbling together a DIY version, as our local RavingBikeFiend did. However, in the near future I already have plenty of bike projects lined up to keep me busy. I generally try to avoid re-blogging and instead generate new content of my own. However, my computer is not working at the moment at my ability to blog is seriously limited by the small amounts of time I can sneak in on my wife’s computer. Today, I’d like to draw your attention to a really excellent WordPress blog: The Online Bicycle Museum. As I have grown increasingly interested in vintage bicycles, this blog has provided endless reading and I highly recommend it. There are numerous “rooms“ in the museum to visit. There are, more especially on the Continent, critics who advocate the use of the folding cycle for military purposes. I cannot but believe that these must mostly be people who have never ridden a folding bicycle. It is heavy, lacks rigidity and strength, entails loss of time in folding and unfolding, and even when it has been folded and is strapped on to the back in such a manner, by the way, that it cannot possibly be unstrapped except by the assistance of a comrade, it is the most unwieldy burden I have ever carried. The advantages claimed for it, even if real, would hardly compensate for these drawbacks; but the advantages are theoretical rather than practical. It is claimed that cyclists when they wish to cross fields, etc., will dismount, fold their bicycles and stow them on, their backs. I was once the proud possessor of a folding bicycle, which I used for experimental purposes, and I can assure you that for half a dozen excellent reasons nothing would induce me to take one on service, or if I did it would never be folded except when the spring got out of order and it collapsed automatically, which is one of its unexpected habits. THE CYCLE IN WARFARE: ITS POTENCY AS A STRATEGICAL AND TACTICAL FACTOR. I could post many more links here, but my stolen computer time will soon be over, so Ithink I will spend it wandering through the online museum myself. 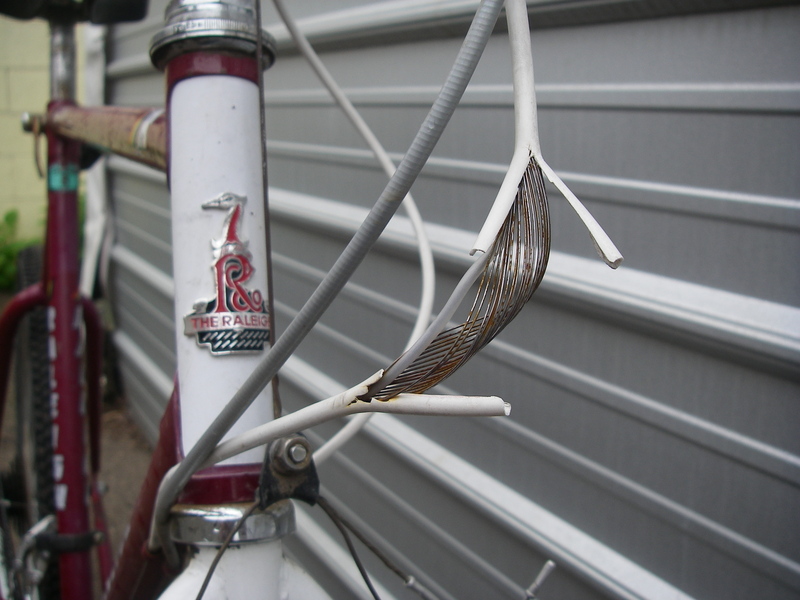 I’m glad it wasn’t the brake cable housing. A couple of weeks ago I rode my recently acquired 1989 Raleigh Rocky II to work with the intent of leaving it there to overhaul it. On the way, the rear derailleur stopped responding to my attempts to shift gears. At first glance I didn’t see anything wrong so I just chugged along the rest of the way in the same gear. When I got to my destination it didn’t take long to find the problem.